“And as Jesus was getting into the boat, the man who had been possessed with demons begged Him that he might be with Him. 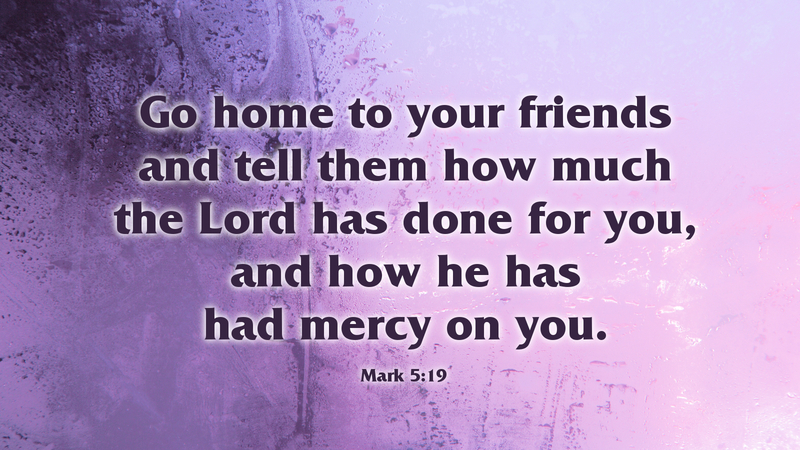 But Jesus refused, and said to him, ‘Go home to your friends, and tell them how much the Lord has done for you, and how He has had mercy on you.’ And he went away and began to proclaim in the Decapolis how much Jesus had done for him; and all men marveled” (Mark 5:18–20). How much has the Lord done for you? Have you ever told anyone how the Lord has had mercy on you, a poor sinner? What would it take for you to tell friends and family what Jesus has done for you? The entire Gospel reading from the daily lectionary tells the story of the healing of the man possessed not by one spirit, but by a legion of spirits! Jesus casts out the spirits so that finally this man is able to leave the tombs among which he had lived and return home to his family and friends. It’s no wonder the man wanted to remain with Jesus, the author of his salvation. It’s also no wonder that, when Jesus sends him home, he is ready and willing to tell others how he had been released from these unclean spirits. We can understand how he might be so grateful, so moved by his newfound freedom that he can’t remain silent—that he can’t wait to proclaim to others what Jesus has done for him. And yet, have we received any less from Jesus? I suppose we would be fortunate to be possessed by only one unclean spirit. Most of us are beset by many unclean spirits in our lives, if not a legion of them! We struggle with spirits of anger, bitterness, jealousy, greed, selfishness—the list goes on and on. At times, we become the living dead, stumbling among the tombs, trudging through life crying out, bruising ourselves with our self-destructive behaviors. We come to Jesus and are set free from our uncleanness, washed by the blood of the Lamb who gives us new life in Him—so that again we have hope and a future. And will we go and tell others, as Jesus commands us? Will we remain silent, or will we find the courage and the gratitude to proclaim to family and friends what the Lord has done for us? Prayer: Almighty God, create in us thankful hearts for all Jesus has done for us, that we may willingly and joyfully proclaim the good news of His love and mercy; through the same, Jesus Christ our Lord. Amen.